Congratulations to Laura and Daniel on their wedding this beautiful, spring weekend! So often we use beautiful floral illustrations on wedding invitations, but this couple wanted something a little different. 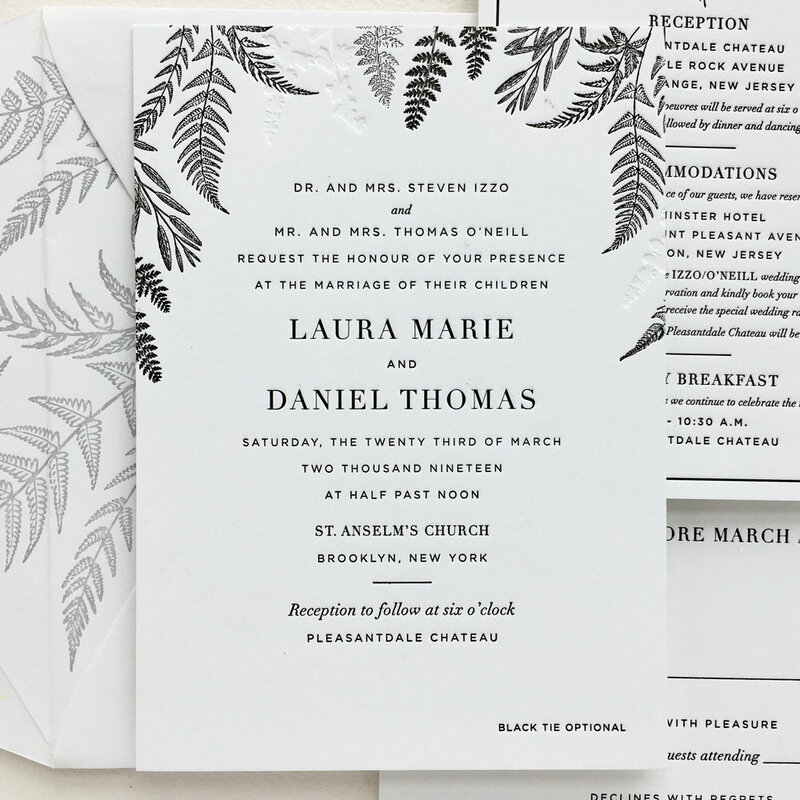 These ferns and fronds, printed in a mix of black ink and a blind emboss, are a nice alternative for an early Spring wedding. 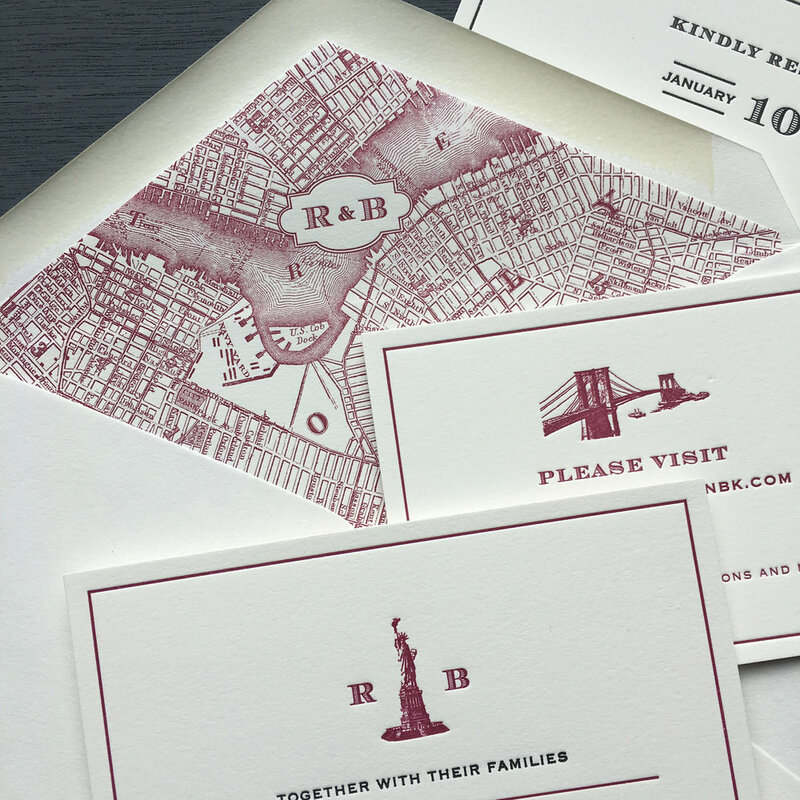 We printed these beautiful invitations for a New York City wedding last year. The cards were all a classic design, printed in rich, black ink, and then we added a surprise element in the form of a bold envelope liner. The NYC skyline printed on the liner was the perfect imagery for this rooftop wedding! Congratulations to Liz and Thomas on their wedding this weekend! We love these classic and romantic invitations with a custom monogrammed wreath. They wanted to embrace the festive spirit of NYC during the holiday season, so the additional elements like the taxi carrying a Christmas tree are just right. The details in the schedule of events and map were fun to design and added a nice, personal touch. We’re excited to announce our collaboration this fall with the Hoxton Hotel in Williamsburg. To celebrate the new location, the Hoxton invited a selection of Brooklyn artists to create a limited edition product inspired by and made in the neighborhood. The collection, “Best of Brooklyn” celebrates the creative spirit and makers in our borough. We love collaborations as they’re an opportunity to push ourselves creatively. We decided to print sets of note cards highlighting some our favorite spots in the neighborhood for drinks, music, sightseeing. Traditional hotel stationery was used by guests while staying in hotel rooms. We’ve designed our set to match the colors of the hotel’s interior but function like a scavenger hunt, sending guests outside. Each card features an image cross-streets in the surrounding area, encouraging people to walk around to discover each site. We hope people will find their own favorite Williamsburg spots in the process! We’re really honored to be included in this collection and definitely recommend visiting the hotel for a drink or dinner and to pick up a couple special, locally-made products, especially with the holidays on the horizon! You can also visit the Hoxton’s site to shop the collection and learn more about the other makers. Our Downtown design has been a popular one for us this year! We love the more casual style, especially for a wedding in NYC. Valerie and Sean found the design to be most fitting for their wedding their wedding at the Norwood in Chelsea. Congrats to Ashley and Lindsey on their recent wedding! 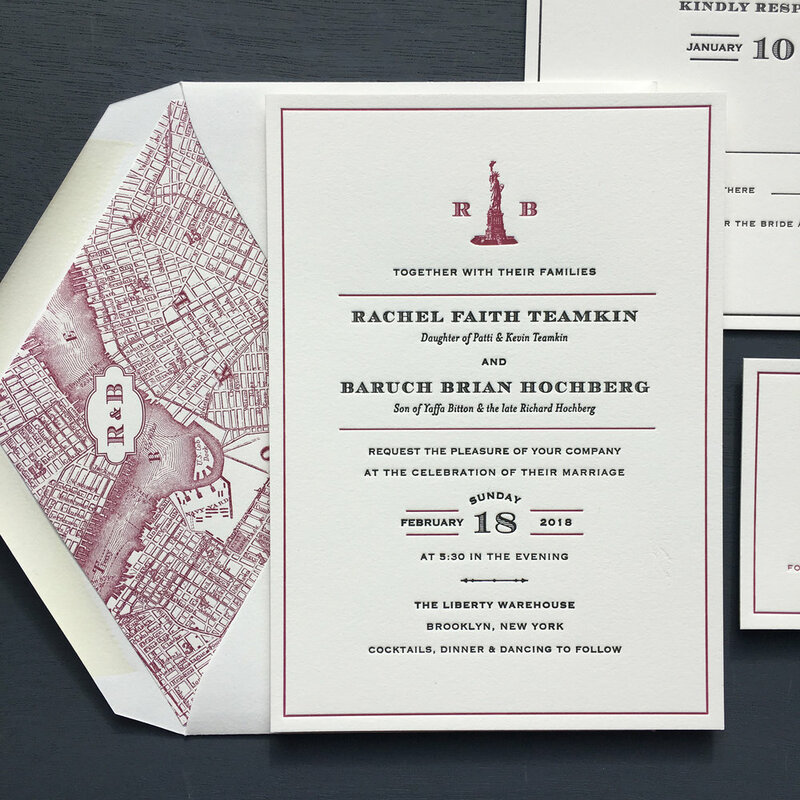 We really enjoyed working on their invitations, which were a combination of our Vintage NYC and Downtown designs. They were inspired by their venue, Houston Hall, and wanted an old New York feeling. The wine red and black ink, with a black envelope makes a really striking set. 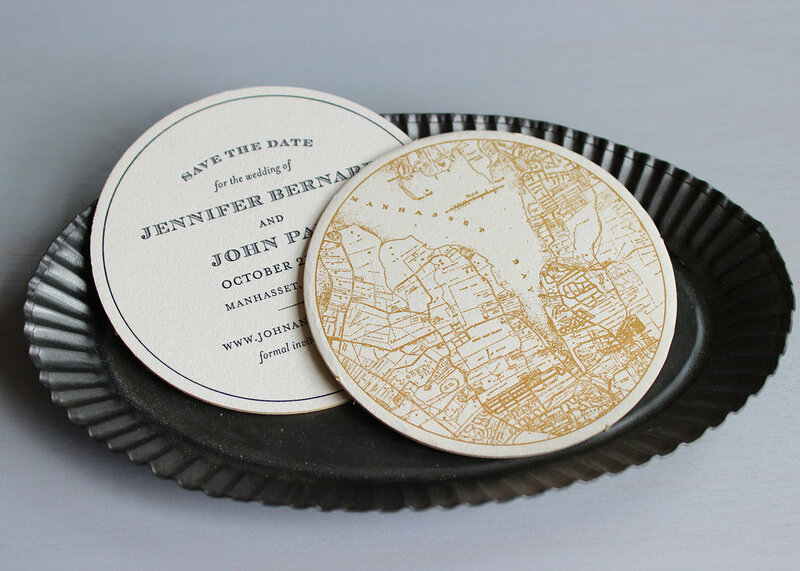 We also designed a Save the Date coaster, in the same style as the invitations to make a complete set. Congratulations Alicia and Jonathan! We worked with them to customize our Hudson design by adding a tinted silhouette of the Statue of Liberty to the background and a sky blue border. The result is subtle and cool - a perfect reflection of their personality. Congratulations to Allison and Adam on their wedding last weekend! All black ink always looks sharp, especially with the graphic images they selected to illustrate the cards in the suite. Cherry Blossoms for a Spring wedding in NYC! Congratulations Christa and Brett! We loved working with this couple on a beautiful set that combined our Hudson design with some subtle cherry blossom imagery. 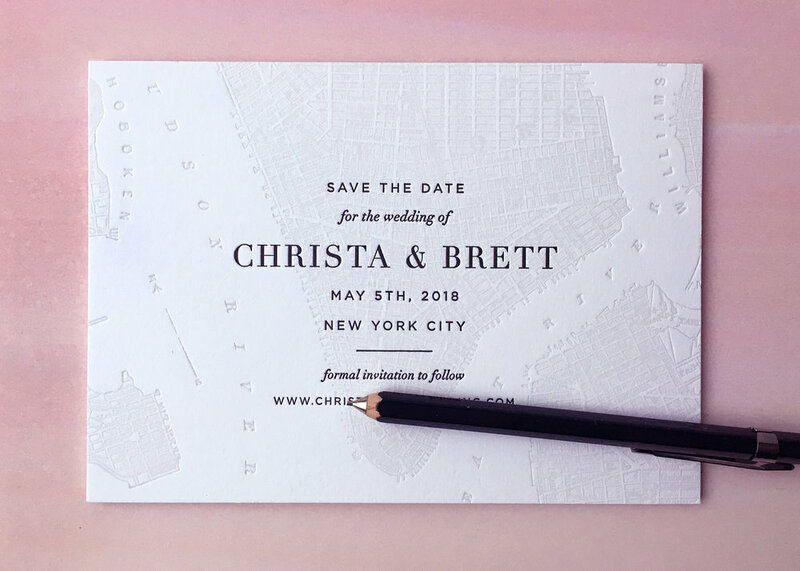 Their save the date featured a tinted vintage map of New York, which looks classic with black text. Congratulations to Caroline and Ryan on their March wedding! 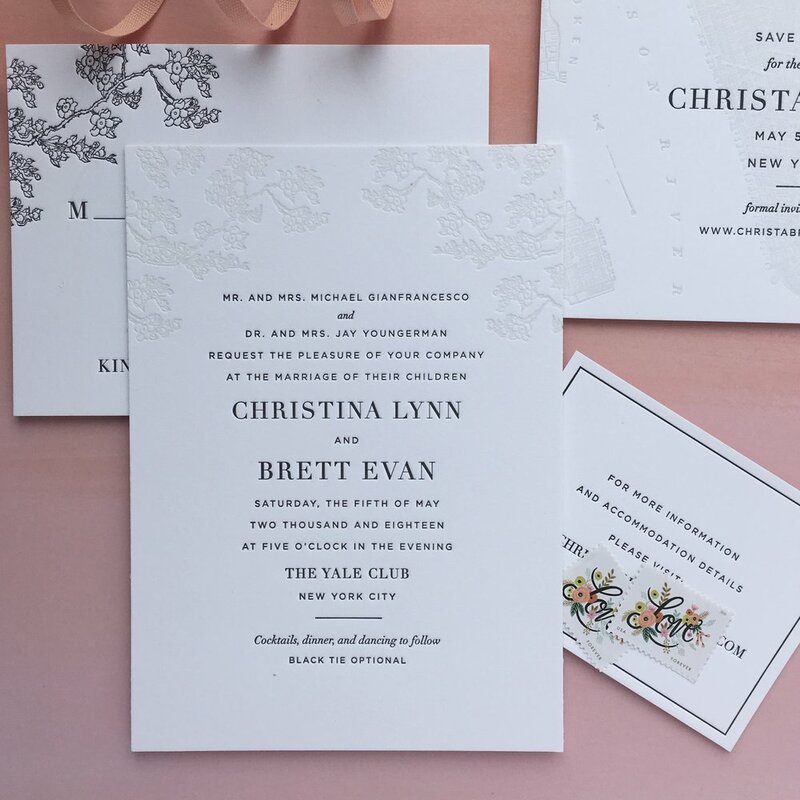 Although most of the couples we work with select one of the designs in our collection, each invitation suite we print looks unique. This is a twist on our Timeless design. They opted for a different script, Miss leGates, and paired the black ink with a jewel-toned red envelope liner. Congratulations to Amanda and Asher on their wedding this week! We've been collaborating with them over the last 9 months to print save the date announcements, invitations and programs. It's been really fun customizing our Downtown design for their wedding (we especially love the carrier pigeon) and we wish them all the best! Congratulations to Rachel and Brian on their wedding this weekend. 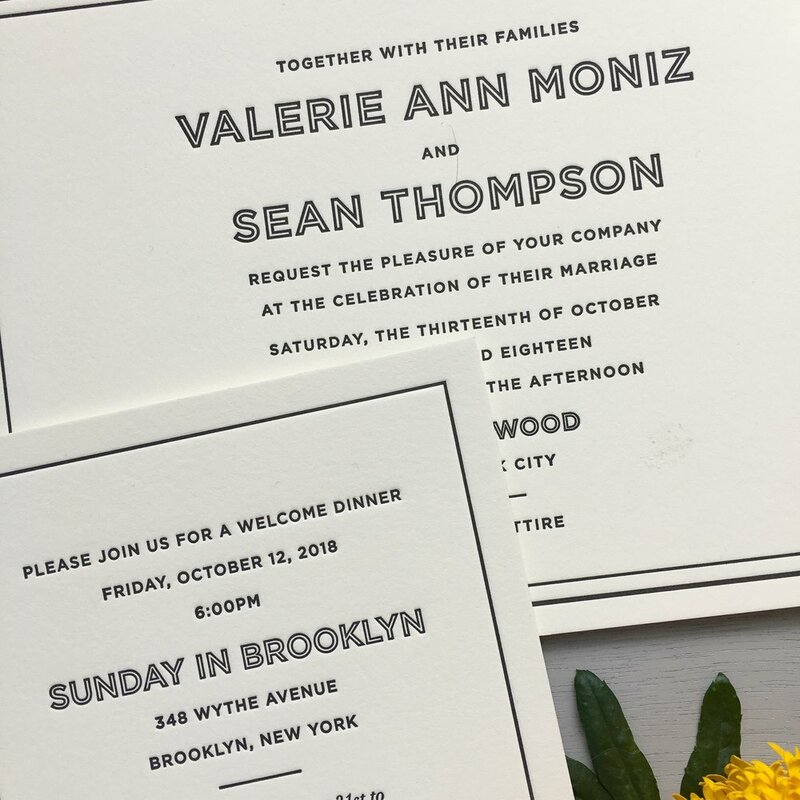 We loved customizing our Vintage NYC design for their wedding at the Liberty Warehouse here in Brooklyn. Congratulations to Lisa and William who were just married this weekend! We loved working on their Gatsby inspired invitations, and all the fun details that were included. The California themed favor tags are so sweet! 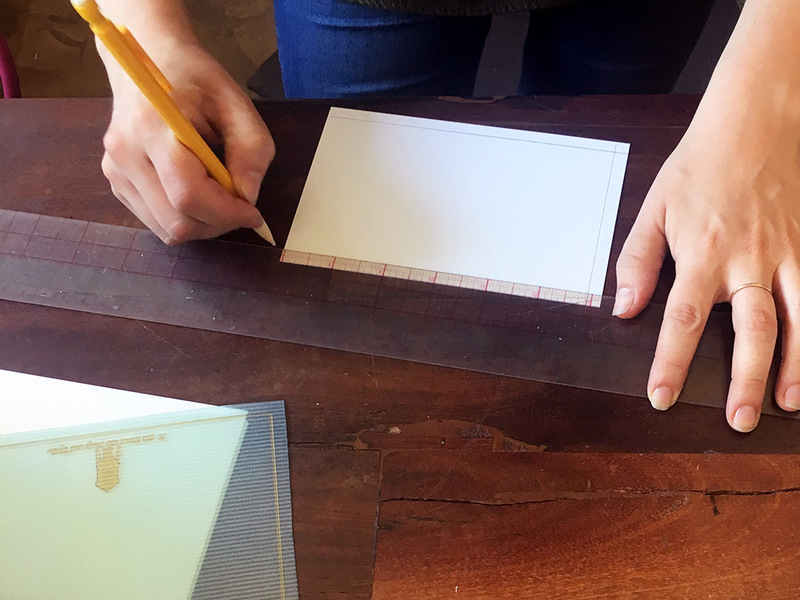 January can be cold and bleak outside, but this month in the studio we're thinking of spring and summer as we're in the thick of the "Save the Date" printing season. These cards can be lighthearted and more casual than the formal invitation, printing in brighter colors or creative formats (like bookmarks or coasters) or they can match the design closely so the guests have a sense of the celebration to come. Regardless of the design, the text for these is usually very minimal. It typically includes the names of the couple, the date, the city of the wedding and often a website address for guests to refer to for details on travel, accommodations, wedding registries etc... For more samples of Save the Date wording, please visit our website where we've added sample text for all the cards in a suite. We want to wish Lisa and Jason an big congratulations for their recent wedding! We are in love with their invitation set. We printed bookmarks for their save the dates, with a tinted embossed map of NYC, and a heart to mark the spot of their wedding venue. They chose a dark marsala red for the text which fits the season! Their invitations continued with the heart theme, and included a tinted Empire State Building in the background. It's such a pretty set, and we're very happy to have helped them on the road to their NYC wedding! Congratulations to Jill and Joe on their wedding last weekend at Linden Terrace at Fort Tryon Park, here in New York City! 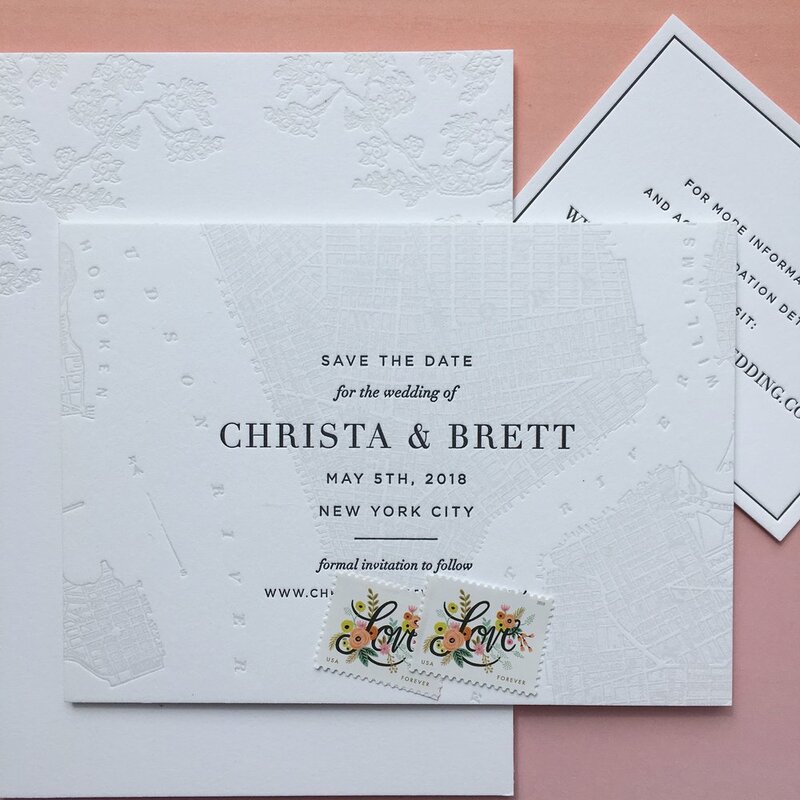 We’ve had the pleasure of working with these guys over the course of a year to design and letterpress print their save the date announcements, invitation suites and the day-of menus. They selected our Hudson design and personalized it with nature inspired imagery and mixing in a warm brown kraft paper. Jill and Joe's save the dates were simple and modern, with the paper choice adding a nice warmth. The rich, black ink on brown kraft paper truly shows off the details of our letterpress printing. The information card and welcome party card in their set both featured different natural elements. The information card on kraft paper has some beautiful illustrations of greenery, while the welcome party is topped with a vintage, flying bird. These seem to be the perfect elements for a wedding in the lush Fort Tryon Park! 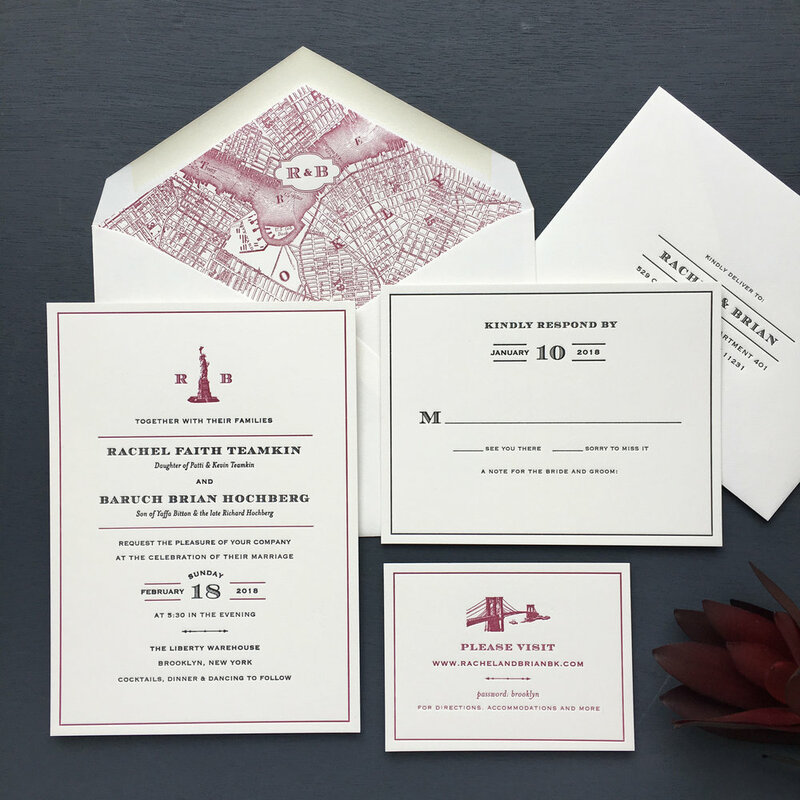 We love these modern letterpress invitations we designed and printed for a wedding this fall. The couple wanted something a little understated and fresh feeling and we think this hits that mark. They opted for rich black ink on warm white paper and we played with some fun line variation on each of the cards. 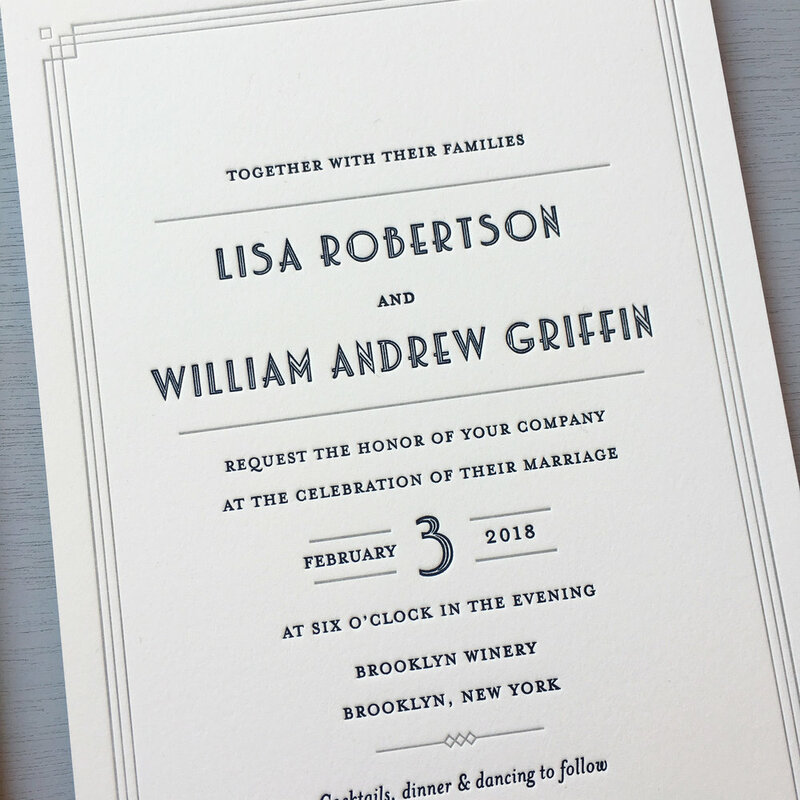 We printed these classic letterpress wedding invitations for a wedding here in New York City this fall. Simple can be beautiful, and that's true in this case. 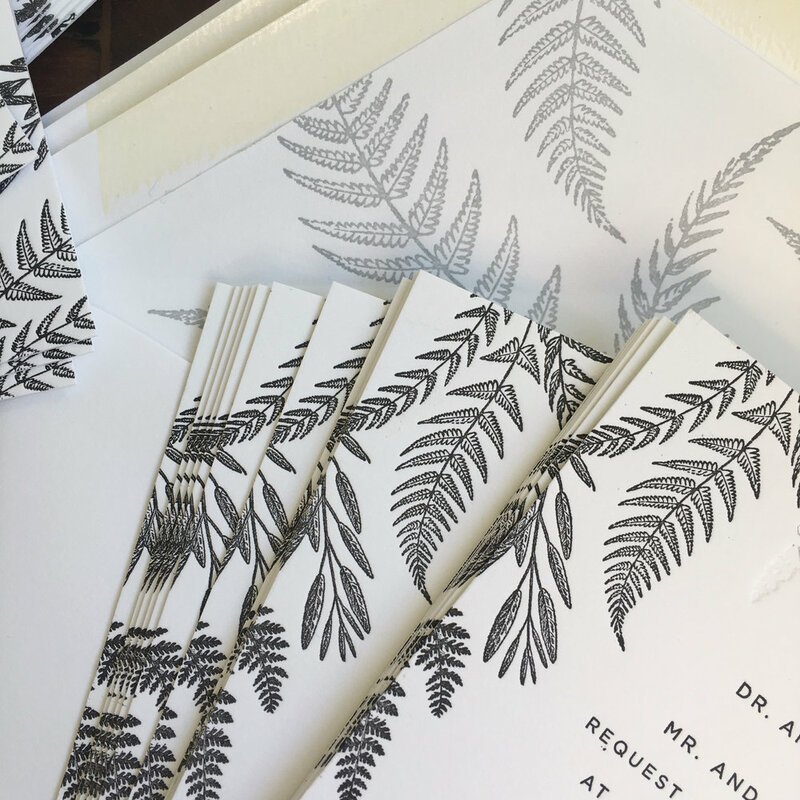 The invitation suite was printed in navy blue ink on a warm white paper. The couple wanted to incorporate a traditional Chinese ornament, so we centered the the design for Double Happiness on top of their rehearsal dinner and information cards. It's such a meaningful nod to the traditions of the groom's family.